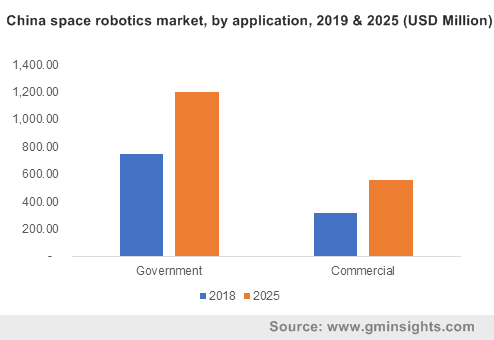 Space Robotics Market size crossed USD 2 billion in 2018 and industry will grow at a CAGR of 6% from 2019 to 2025. High investments in the space exploration projects and launch of several satellites by countries including the U.S., Russia, India, etc. 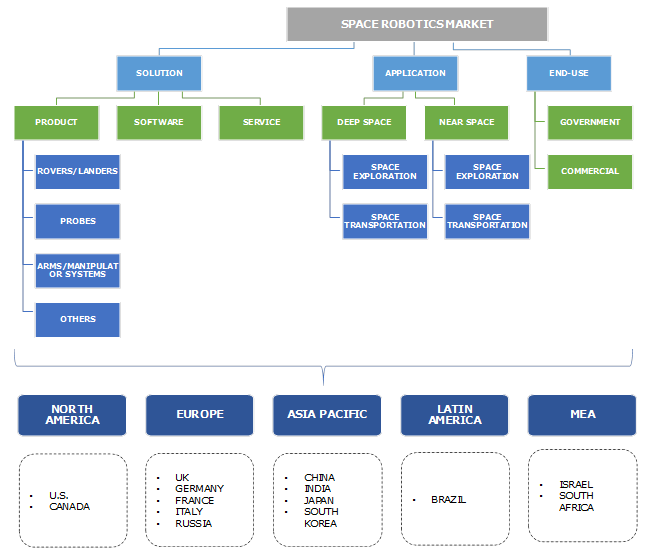 are driving the global space robotics market. The need to efficiently maintain, repair, and service spatial objects at timely intervals with high accuracy & automation is creating the need for these robots. Various applications, such as exploration, construction, maintenance, assembly, and servicing of spatial satellites, are performed by these machines. The industry is gaining high popularity due to the benefits such as cost-effectiveness, better productivity, and the ability to perform in risky situations over human substitutes. To gain efficiency in unmanned on-orbit servicing projects, such as refueling, docking, berthing, upgrading, repairing, and removal of the orbital debris, these machines are utilized across both commercial & government sectors, developing the market. The space robotics market is hindered by mobility & manipulation issues in fixed orbits. The products such as probes and rovers face issues in moving quickly & accurately between two points by avoiding the chances of collisions. While manipulating the spatial objects by arms for working with other elements, the machines face challenges such as accidental contacts, unsafe movements, etc. These challenges can be eliminated by enhancing the supervisory control from human operators, which aid in managing the duration delays. In the space robotics market, the on-orbit services are growing rapidly due to the provision of solutions that offer satellite servicing, logistics delivery, asset relocation, debris removal, infrastructure maintenance, and repair. These services reduce infrastructure maintenance costs by performing routine servicing processes and aiding the equipment for challenging activities. By adopting the on-orbit servicing solutions, the issues & amount of space debris can be reduced at high levels. They aid in increasing the spacecraft lifespan by safe & secure servicing along with reducing the risks of its failure. These solutions are economical over new satellite launching due to the efficient repairing & maintenance offered by them further saving huge costs. Companies are launching new products & components to be integrated in servicing satellites, creating the space robotics market development prospects. For instance, in August 2018, MDA announced that its subsidiary Neptec UK Ltd. had a contract with Effective Space for supplying infrared camera and space flight LIDAR for the OOS-based spacecraft. Deep space exploration applications in the space robotics market is expected to gain traction in the coming years owing to the utilization of humanoid robots for exploration operations. Extreme & deep space environments are dangerous for human operators & astronauts, who are being replaced by robots that can perform high-risk tasks. Several government agencies including NASA are working on developing robots efficient enough for deep space exploration works. The newly developed robot explorers are integrated with AI, autonomous functions, and intelligent technologies to offer higher bandwidth communication in deep space operations, attributing to the industry growth. For instance, in January 2016, NASA announced its plans to develop humanoid robots for its future missions related to deep space exploration by R&D activities and government investments. Governments’ investments & projects in various countries are supporting the global market expansion. Initiatives to develop and launch various spacecraft & satellites by several governments, including the U.S., Canada, India, etc., are adding up to the industry growth at a rapid pace. For instance, in December 2017, the Federal Government announced that it is aiding the advancement of future space exploration mission in Canada and investing on space technologies, creating several employment opportunities in the country. The Minister of Innovation, Science, and Economic Development announced a total investment of about USD 54 million for developing enhanced products in the space robotics market. In November 2017, a FAIR-SPACE hub was launched in the UK for R&D activities related to space robotics & AI. The government launched this hub as a part of its R&D funding of USD 110 million for robotics & AI utilization in extreme space environments. 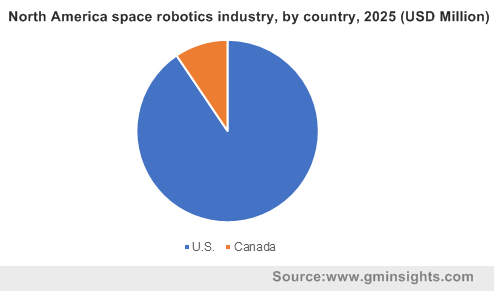 The North America space robotics market is developing at a rapid pace due to several ongoing & upcoming projects related to space robot development in both the U.S. and Canada. The countries are witnessing a huge investment in the space exploration projects along with R&D activities for developing various humanoid robot technologies. The presence of several players in the region also adds up to the prospects for faster expansion. Moreover, the high focus of government agencies to efficiently service, maintain, and track the existing spacecraft & satellites serves as a major driver for the regional market growth. Prominent players in the space robotics market are Northrop Grumman, Maxar Technologies, Altius Space Machines, Honeybee Robotics, Orbital ATK, Motiv Space Systems, etc. All these players are developing technically-advanced robotic systems along with efficient servicing solutions to lead in the competitive industry and gain contracts from various governmental organizations. Companies along with international organizations are developing AI-integrated robots to add smart technology benefits to the existing solutions in the market. In March 2018, Orbital ATK announced the launch of its new robotic system servicing solution along with additional customer options to enhance satellites. The new system aided the company in expanding its customer base. The space robotics industry is slightly consolidated with the presence of a few players holding majority of the market share. Companies are developing highly-efficient robotic technologies as a result of robust R&D activities and high investments. The industry is witnessing a continuous funding for research purposes from governmental organizations for the development of strong capabilities such as satellites, spacecrafts, etc. Manufacturers and service providers are facing technical challenges, such as unexpected breakdowns, improper functioning, hardware & software incompatibility, etc., during the development & testing phases. However, efficient engineering techniques and enhanced system integration can eliminate the challenges and further support the space robotics market expansion.